Housepets! Don’t Criticize Your Lovelife – comic review by Fred Patten. North Charleston, SC, CreateSpace, November 2014, trade paperback $13.95 (52 pages). Yes, Book 5 has a real title page! However – well, my reviews of the first four books have all recommended that unless you have them all, you should start with an earlier volume to get to know the cast. That is particularly true of Book 5. It begins with the dogs and cats of Babylon Gardens “imaginating” their own version of Guys and Dolls by Loesser, Swerling & Burrows. If you’re familiar with the Broadway musical and with Peanut, Grape, Tarot, Max, Sabrina, and the other housepets of Housepets!, fine. If not, Book 5 is a really confusing one to start with. Fortunately, practically all readers of Dogpatch Press already follow Housepets! regularly – don’t you? Housepets! is an online Monday-Wednesday-Friday comic strip that began on June 2, 2008. It has won the Ursa Major Award for Best Anthropomorphic Comic Strip for every year since 2009. The four previous collections are Housepets! Are Naked All the Time, Housepets! Hope They Don’t Get Eaten, Housepets! Can Be Real Ladykillers, and Housepets! Are Gonna Sniff Everybody; all previously reviewed on Flayrah. Housepets! Don’t Criticize Your Lovelife (Book 5) starts with the online strip from June 6, 2012 and ends with that from June 3, 2013. These are the story-arcs #56, “Let’s Imaginate Guys and Dolls” to #69, “The King and I”, plus one-off gag strips between those. Housepets! is the story of the dogs, cats, ferrets, rabbits, and other pets of Babylon Gardens, a typical residential suburban neighborhood – in an alternate universe. The animals are larger than in our universe (but not human-sized), can talk, are usually bipedal, and address their human owners as “Mom” and “Dad”. Their status is somewhere between pets and children. Points established over the years are that humans can bequeath their belongings to their pets, who do not need a human guardian; human storekeepers are not allowed to sell catnip to cats; human police forces have an auxiliary of Police Dogs who are not all police dogs; the pets comment sardonically on how they can go naked in public but their human “parents” can’t; and – lots of other stuff. 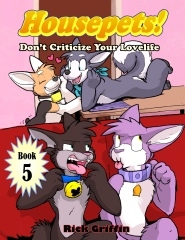 Most of what’s in this book is available for free on the online Housepets! Archive, but it’s so much easer to read in this full-color collection than one strip at a time on the website. During this June 2012 to May 2013 year, aside from the one-off gag strips, just enough of Peanut Butter Sandwich’s “Spot’s Adventures” amateur comic strip to keep the idea alive, and such comedic story-arcs as the Guys and Dolls sendup, and Itsuki the tanuki (from Japan on a student visa) trying to take a test with his cell phone going off (and Rick Griffin cannot be praised enough for showing the differences between a Japanese tanuki and a North American raccoon! ); the overall serious story development is King, the human animal-hater turned into a Corgi by Pete the demigod-gryphon (long story), accepting his dog nature and falling in love with Bailey (Husky), and finally (the conclusion of Book 5) marrying her. In addition to the reprints, Griffin has padded out the story format with some new art – mostly throwaway filler, but Griffin is such a popular artist that his fans will want to have even this filler. Plus it’s not all throwaway art: there’s the delightful Hallowe’en panorama at the bottom of page 25, for example. The subplot of the demigods’ (Pete the gryphon, Cerberus the three-headed dog, the dragon, the nine-tailed kitsune, etc.) exercising control over this alternate universe is largely absent in Book 5, although it should return in Book 6. Griffin has been a fan-favorite artist since he started Housepets! in 2008, and this collection demonstrates why. To reiterate, Housepets! Don’t Criticize Your Lovelife is a must-have if you’ve got the previous four Books. If you don’t, you’ll do better to start with Book 1 or Book 2 first. All are available on Amazon.com.